Then Join Us for a Visit. The AE campus is eminently walkable. Most of the classroom, lab, and office facilities can be found in the Daniel Guggenheim, Montgomery Knight, Engineering Science & Mechanics (ESM) and Weber buildings, all located on Ferst Drive and Cherry Streets. Additional on-campus facilities include the Ben T. Zinn Combustion Lab, and the High-Power Electric Propulsion Lab, both located in the Research Park on North Avenue; the Institute's Observatory, located atop the Howey Physics Building; and the autonomous racetrack facility on Marietta Street. Off-campus facilities at Ft. Benning and in Cobb County allow faculty and students tremendous freedom in testing unmanned autonomous vehicles (UAVs) and new space craft designs. 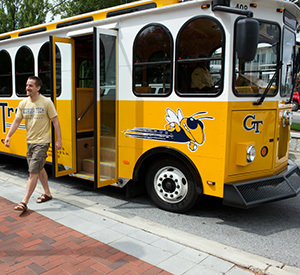 If you are considering Georgia Tech's Aerospace Engineering School, a visit will certainly help you decide. The School hosts 8 a.m. informational sessions on Mondays, Wednesdays, and Fridays in Room 325 of the Montgomery Knight Building. These sessions are scheduled to allow you to attend other valuable information sessions and to take advantage of campus tours. We recommend you email AE two weeks before your visit to reserve a spot. If you are a student, faculty, or staff person, admittance to most AE facilities is regulated with your BuzzCard. This magnetized ID card is programmed to meet the specific access needs of faculty, staff, and students. Keys to specific locales are issued to faculty, staff, and, at the discretion of supervising faculty or staff, to students. Problems with the BuzzCard or requests for keys should go to the AE assistant director for operations, whose office is in Montgomery Knight 311.